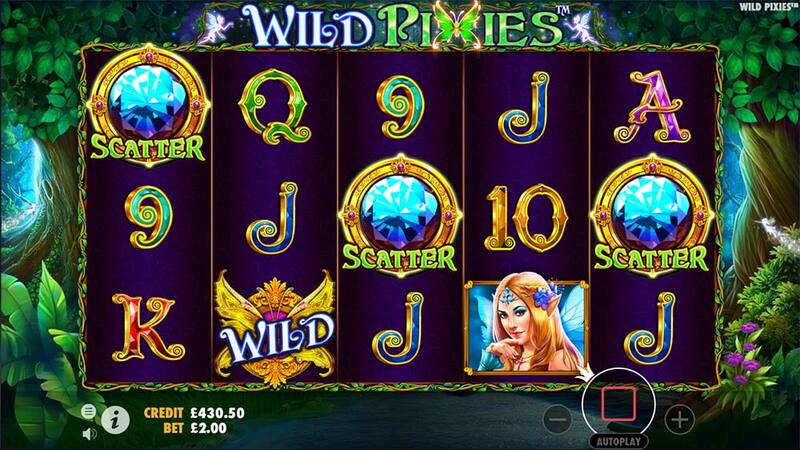 We Check Out Pragmatic Play’s Latest Enchanted Garden Themed Slot Release Wild Pixies! 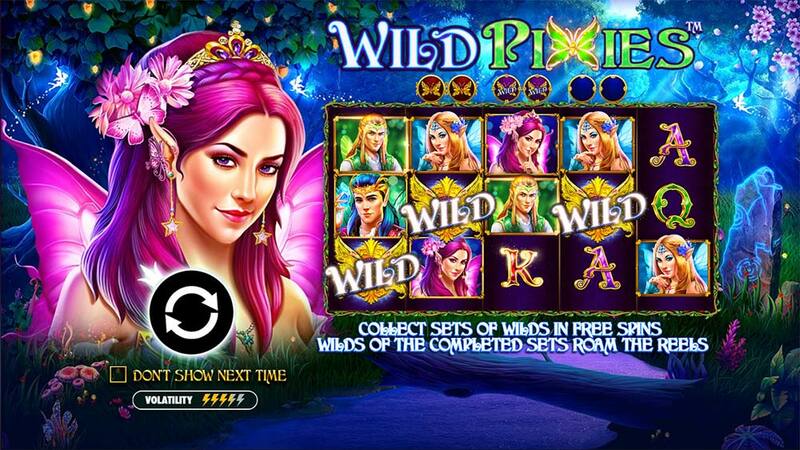 Pragmatic Play will be releasing their latest online slot Wild Pixies on the 11th April 2019 and with Videoslots Casino already having a vast selection of their slots we think this will be the best casino to check out this new title. 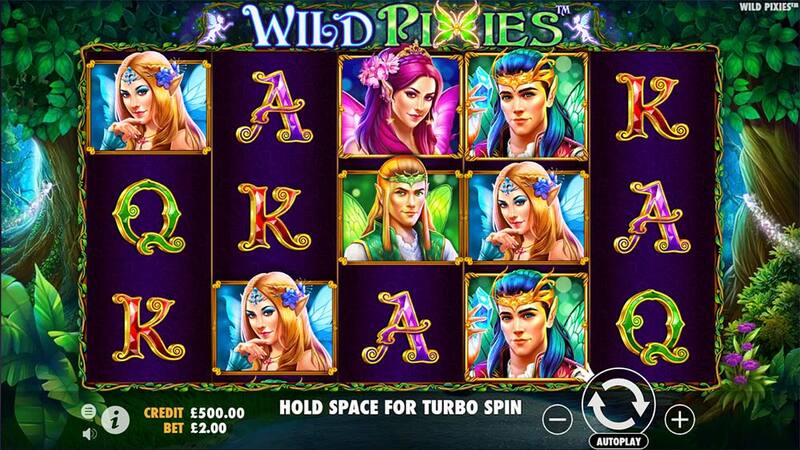 As the name suggests, Wild Pixies has an enchanted forest theme with wild pixies and magic butterflies adorning the reels, at the heart of this game is a regular 5×3 reel 20 payline slot with a couple of added features that include roaming wilds, scatter nudges and of course free spins. Looking through the paytable is a little disappointing as the 5 of a kind wilds look to be the only real decent wins on offer, Pragmatic Play has marked this as a 3.5/5 volatility release but in comparison to all other developers, we would suggest this is more geared towards the lower variance style of slots. 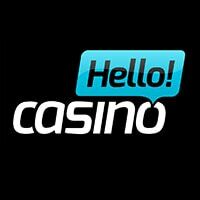 The main bonus round is triggered by the regular 3 scatters, with the addition of a Bonus Nudge feature that can nudge a scatter on the 5th reel into view if its close and this then awards a starting 8 free spins. The bonus round is where the Roaming Wilds come into play, but first, you will need to collect at least 2 of the wild butterflies for this to happen, with the amount of captured wilds easily tracked in the collection meter above the slot. The Roaming wilds are released onto the reels when 2, 4 and 6 of them have been collected and these then stay active on the reels for the remainder of the bonus round. 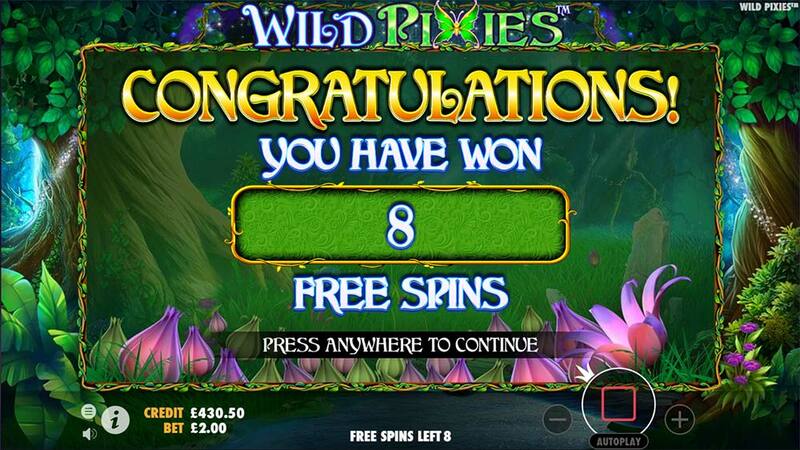 There are a couple of extra free spins granted each time you have collected 2 wilds and this helps extend the bonus round but there is no full re-trigger on offer in this slot so the ideal situation is to capture 6 wilds as early as possible giving you several free spins still left over with 6 roaming wilds on the reels. Can occur randomly on the 5th reel when a Scatter symbol lands just out of view on the reels, can nudge up or down 1 position to trigger the free spins bonus round. Triggered by landing 3 Scatters in the base game and awarding an initial 8 free spins. During the bonus round a collection meter is active above the reels, when 2 wilds are collected the Roaming Wilds feature activates adding 2 wilds backs onto the reels for the duration of the bonus round. 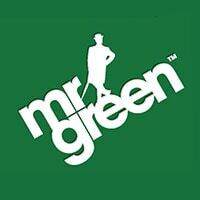 You are also awarded 2 extra free spins for every 2 wilds collected up to the maximum 6 roaming wilds. 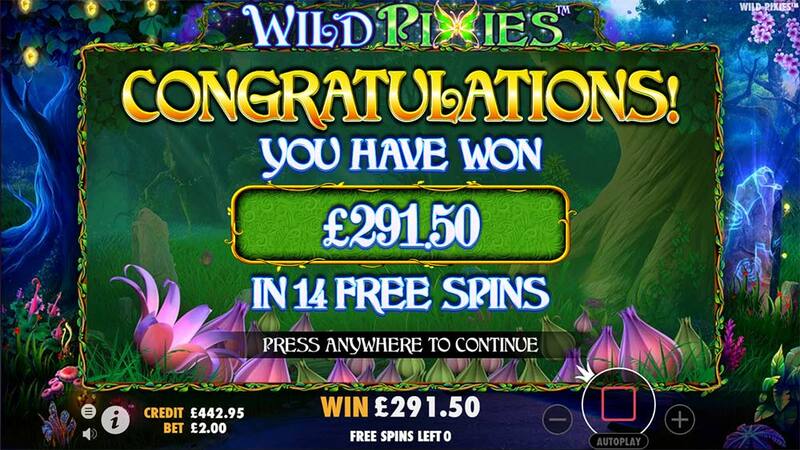 We have mixed thoughts on Wild Pixies from Pragmatic, the graphics, animations and theme are all top quality but the overall enjoyment we had from playtesting this slot was disappointing. The base game is fairly mundane with no real extra features to look out for, the good news is that the bonus rounds were quite frequently triggered, with the scatter nudge feature helping out a couple of time but these ranged from extremely disappointing bonuses to decent end results (over 100x stake). 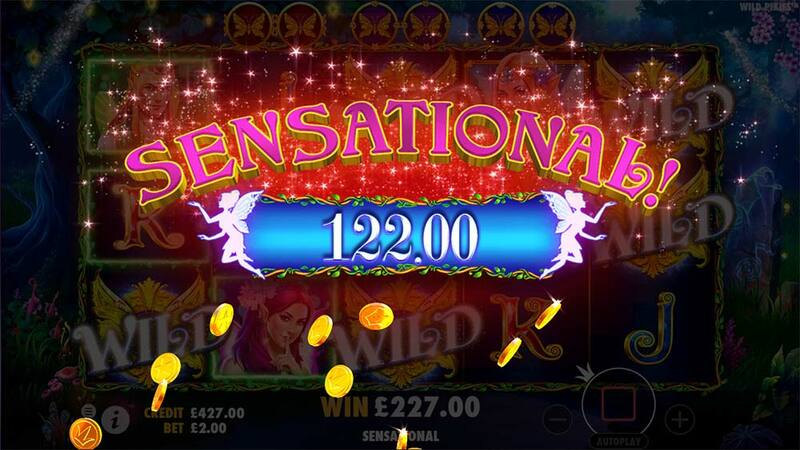 To really get any decent sized wins you are totally dependant on the Roaming Wilds feature, not just this but landing lots of wilds early into the bonus round for a chance of some bigger wins with 6 roaming wilds on the reels and several free spins left. Overall its a graphically superb slot that is somewhat let down by the paytable and a lack of random extra base game features.